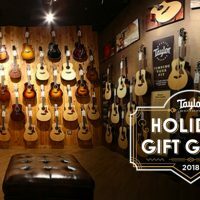 The Grand Auditorium is Taylor’s most popular body shape, thanks to a design that accommodates a full range of playing styles. 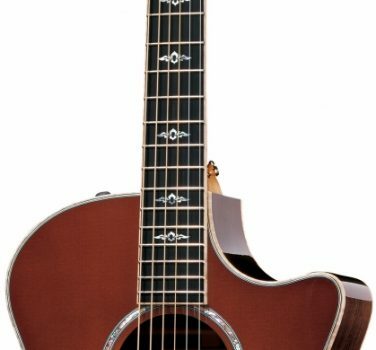 As a medium-size shape, it’s physically comfortable to play, and it responds with a pleasing blend of volume, clarity and tonal definition, making it a great choice for light to medium strumming as well as fingerstyle playing. Its body dimensions tend to produce a less bass-dominant sound than a larger-size guitar, giving it a more evenly balanced voice that fits well in recording or live performance scenarios. If you had to pick one body style to cover the most ground, a Grand Auditorium is the one. You can learn more about the GA shape and browse models here. Grand Auditorium models can be identified with the number “4” as the third digit in the model number (such as 614ce or 524e). Whether you’re a beginner or a seasoned player, the Grand Auditorium’s versatility makes it a superb choice as an all-purpose guitar. Here are five models worth a test-drive. 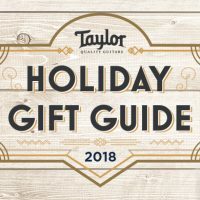 The 814ce is the quintessential Taylor model and continues to be the best-selling high-end acoustic guitar in the industry. Rosewood back and sides and a Sitka spruce top give this GA a rich, luxurious low end and sparkling highs, which together project a high-definition voice that’s incredibly responsive. 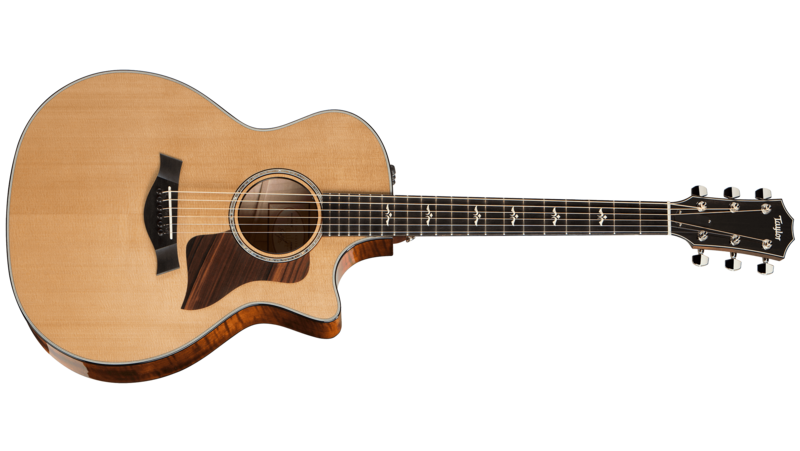 It’s also fortified with a slew of tonal refinements that that reflect virtually every material ingredient of the guitar, from woods to glue to finish, giving the 814ce more volume, midrange and sustain. 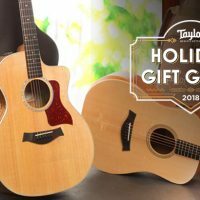 If you’re looking for the ultimate-sounding Taylor acoustic, it’ll be hard to top this modern classic. Learn more about the recent updates to the 800 Series here. 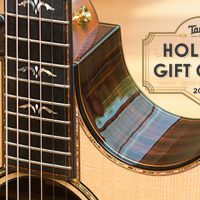 Our award-winning maple/spruce 600 Series boasts a comprehensive package of tone-enhancing refinements that has transformed these guitars into incredibly musically expressive instruments. The versatile Grand Auditorium 614ce is complex and dynamic, with rich tonal character and sustain. 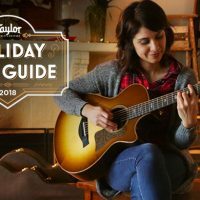 It’s one of the best all-purpose guitars a player will find, and it’s wonderfully responsive to a skilled player’s nuanced techniques. 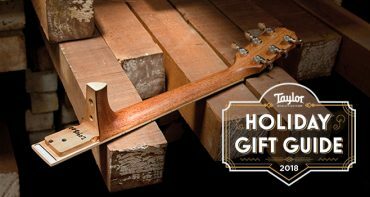 One other design touch that’s exclusive to the series: a torrefied (specially roasted) spruce top, which accelerates the aging process to give a new guitar the seasoned character of an older, played-in instrument. You can read more about the voicing refinements to the 600 Series, along with music magazine review excerpts, here. Though the African ovangkol used for the back and sides might not be a household name, its sound has been winning over players for years. 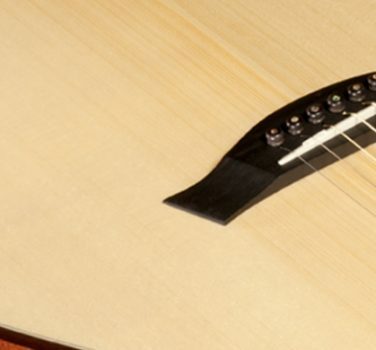 Ovangkol is often compared to Indian rosewood in its broad tonal spectrum, with nice low-end depth and top end chime. It also sports a full-sounding midrange. The overall tonal breadth and dynamic range translate into a guitar that can cover a lot of ground, especially in the Grand Auditorium body. 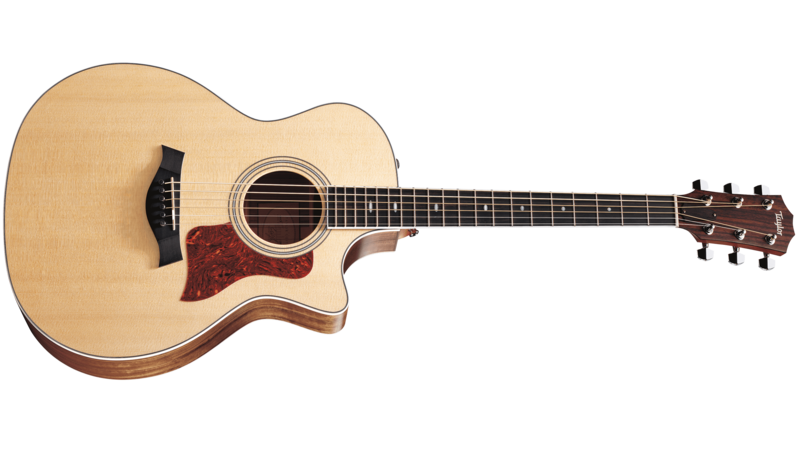 It’s also offered at a more accessible price point than an 800 Series rosewood guitar. 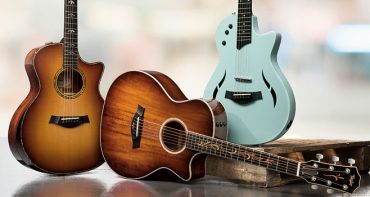 With all-solid-wood construction and our natural-sounding onboard ES2 pickup, the 414ce makes a great guitar for gigging musicians, singer-songwriters, and anyone looking to raise their musical game. 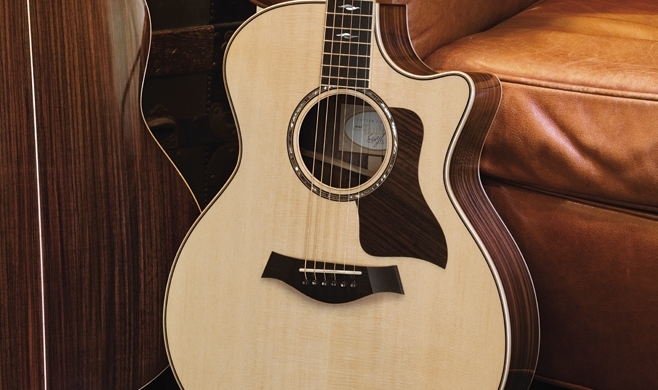 Our 314ce has introduced countless players to the pleasures of the all-solid-wood playing experience, which translates into greater tonal complexity and a guitar that sounds better as it ages. Sapele back and sides produce a clear, balanced tone across the frequency spectrum, resembling mahogany with a splash of extra top-end brightness. 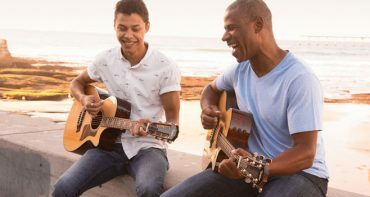 This guitar sounds great on its own, together with other instruments, and with the ES2 pickup, serves up clear amplified tone for plugged-in applications. 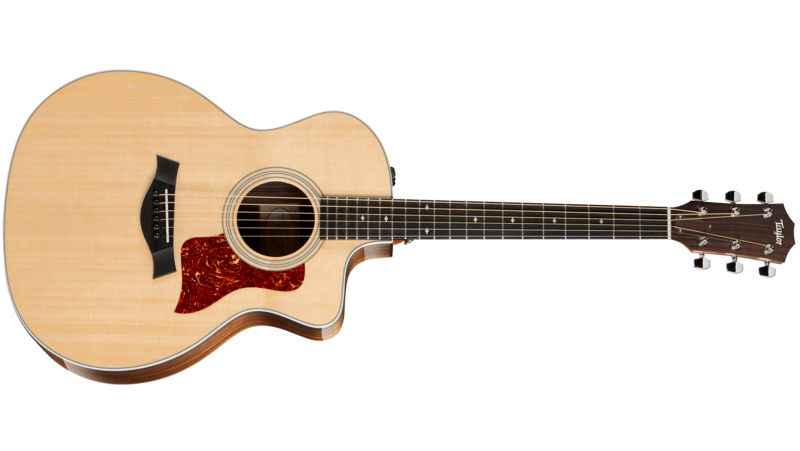 If an all-solid-wood guitar is beyond your budget, the 214ce DLX from our 200 Deluxe Series is the next best thing. 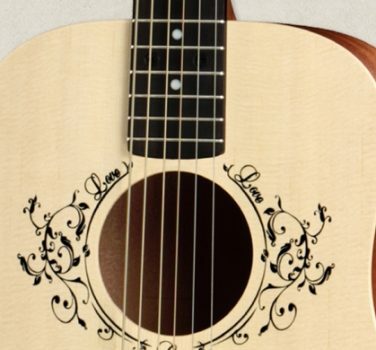 It features layered rosewood back and sides, with a solid spruce top that yields plenty of tonal power and clarity. 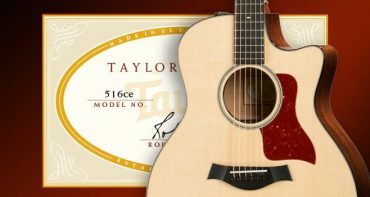 Everything else is signature Taylor: buttery playability, precision craftsmanship, and refined aesthetic touches. Between the full-gloss body, ES2 electronics, and the hardshell case that comes with the guitar, you’ll be equipped with everything you need to take your playing to the next level. 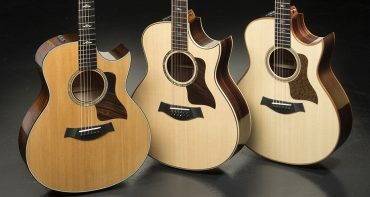 To test-drive these and other Taylor Grand Auditorium models, visit your local authorized Taylor Dealer.